Religion and Spirituality are like peanut butter and honey. They have been sandwiched together for so long that most people do not realize they are two separate and very distinct flavors"
Far too many of us go through life afraid to move forward or hesitant to try what we have always dreamed of. We are often unknowingly trapped in fear, guilt and shame as a result of the beliefs that were placed upon us as children. Although these fear-based beliefs may not be consciously visible, they profoundly, yet subtly, prevent us from finding inner joy and real genuine success. 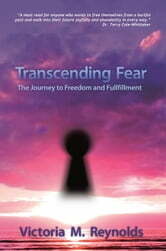 In Transcending Fear Victoria shares the process she used to overcome the pain of her past and the subconscious remnants of her childhood fundamentalist religion. By freeing herself physically, mentally, emotionally and spiritually, she found the joy and fulfillment that is every humans birthright. This story of liberation is shared in a simple step-by-step process that anyone can use to free themselves from the pain of the past and step into the future with greater confidence and enthusiasm. Begin Here. Discover Love the foundation for all else. What If We Are One?